Within days of posting about Kate's diagnosis, I received a wonderful e-mail from an amazing woman! Over the past 5 weeks, I have gotten to know that woman - her name is Erika, and she works for DKMS Americas. Erika has answered questions, provided resources, and acted as a knowledgeable support for me while trying to figure out what we can do to help not just Kate, but others in need of a bone marrow transplant. DKMS is an organization that devotes all of the time and energy into any and everything related to bone marrow donation/ donors in order to save lives. Through generous donations, DKMS is able to cover the cost of processing the tests (a simple cheek swab) required to join the registry! DKMS is working with our friends and family and is helping my sister, brother in law, and their church family hold our first bone marrow drive in Kate's name. ﻿If you are in the Central Florida area, know someone in the Central Florida area, or will be visiting Disney World and want to drive an hour to help save a life (kidding...kind of!) please consider stopping by FMU Ocala and becoming a donor. I know there are a lot of myths surrounding the bone marrow donation process so please, take some time, browse the DKMS website, and educate yourself!! And, for those of you that are not in Florida, and want to help, I have great news!! Becoming a donor is very easy! All you have to do it click the widget below, make sure you meet the donor requirements, fill out your information, and wait for your kit to come in the mail! Once it arrives, all you have to do is swab your cheek, and send the kit back to the lab! The neat thing about this widget is that it will track how many people join the registry in Kate's honor! I have a goal of 200 new donors signing up between the drive in Ocala and people joining via the link here! Do you think that is attainable? I sure hope so! 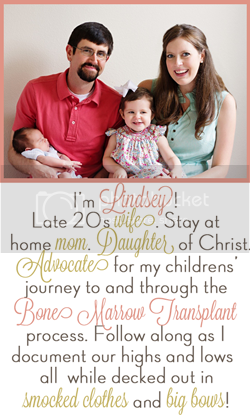 And I hope each and every one of you will considering joining the registry to help us meet our goal! This is so great! Just wanted to let you know that because of Kate and the daughter of a friend of mine dx w/leukemia (the same week! ), I joined the registry. Obviously I can't donate right now since I'm pg, but it is just such an amazing gift. Thinking of you guys. Hey, are they going to add Kate to the donor drive list for people who want to donate money? Hey, I registered!! Love you! Just wanted to say count me in those 200, I already registered last week :) Sent in my swabs as well. YAY - that is so wonderful that you are going to be doing a drive!! I signed up through Be the Match several weeks ago...so you can count me as a new donor in honor of your precious Kate!! Hope you guys are having a good week! You should see if the MJ Morning Show will advertise this. They are played all over Florida. Sending lots of positive thought your way. You should see if the MJ Morning Show will publicize this. They are heard all over Florida. Sending lots of thoughts your way. Count me in as part of your 200. Your story is so inspiring! I'm mailing in my kit today and praying for your family daily! I just started reading your blog yesterday (started at the begining and just made it to the end) and I too am so inspired by you and your beautiful daughter. I had already been considering registering with Be the Match for other reasons, but now I am going to register with DKMS in honor of Kate. I have her and your family in my thoughts and prayers and posted the Pray for Kate button on my blog as well.